In a world of cars that seem to gain poundage and the corresponding waist size on a yearly basis the Prius C is an outlier. When Prius first rolled off the lot in 2001 it cost just $20,000, weighed in at 2,765lbs and offered 52/45 MPG ratings. Today the Prius comes in at $24,000 base, 3,050lbs and 51/48 MPG and has become a practical family vehicle. The Prius C cuts that fat and returns the Prius to its original roots. The baby Prius has a base price of $23,000, weighs in at a svelte 2,500lbs and gets 53/46 MPG. If you’ve been in a Prius the Prius C’s interior will look very familiar, with a few exceptions including a nicely upgraded dash and the inclusion of a more traditional shifter. The high-resolution LCD featured in the dash of the Prius C is quite nice and is a nice step-up from the standard Prius. Interestingly the Prius C’s interior shares little with it’s younger brother Yaris, besides an ample application of plastics. While it’s easy to knock the Prius’ hard plastic interior — only the “four” recieves some pleather upgrades — the fit and finish is actually quite nice and above average for the segment. The Prius C’s touchscreen Entune navigation system blends a pretty decent audio head unit with a flash based navigation system and smartphone integration. The cool thing about the Entune system is that it doesn’t require an XM or Sirius subscription in order to pull data, instead it uses your phone’s data plan. Of course, if you’re smartphone-less this could be an issue. Toyota resurected the original 1.5L engine from the first generation Prius for the Prius C and even squeezed 3 more horses out of it for a total of 73HP and 82ft-lb of torque. The engine is paired to an all new Hybrid Synergy Drive which has smaller motors for an overall lighter weight in a much smaller package. When engine meets synergy drive you get a total system horsepower of 99HP and 125ft-lb of torque. When tires hit the pavement you can expect to get the Prius C from 0-60MPH in about 11 seconds. Driving the Prius C is an interesting experience. Typically when I review a car I push it to see how fast I can get to 60 or to see what sounds I can elicit in response to a heavy foot on the peddle. This car, however, found a different response. 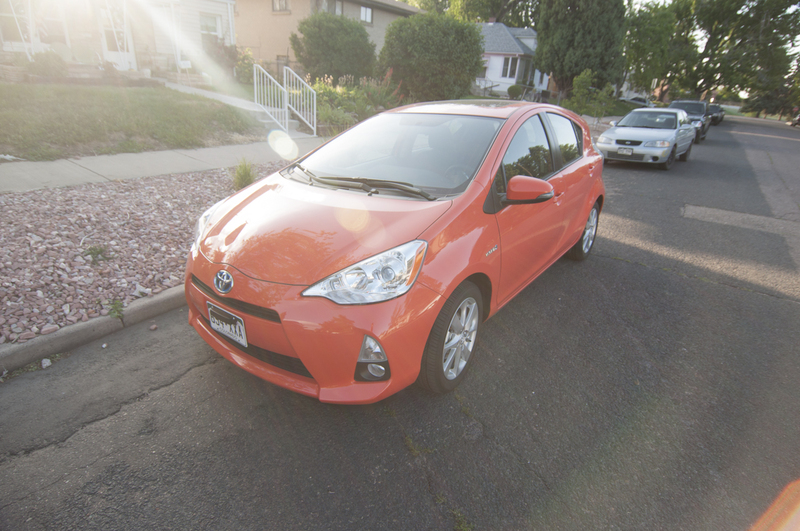 Driving the Prius C made me a hypermiler. I wanted to squeeze as many miles out of each drop of gas as possible. I found myself going 3 under, driving in the right lane and keeping my road rage in check. The response was not a conscious effort it was an almost therapeutic in effect. The resulting gas mileage number were truly impressive, I average about 64MPG on the highways and around 51MPG in the city. On the road Prius C drives confidently and comfortably, road characteristics are almost exactly what you would expect from a vehicle this light and 8 inches shorter than a VW Golf. The Prius isn’t a corner carving sports car, but thanks for its lightweight it handles quite well compared to most of its competition in the segment and ulike most of the segment it can make mountain curves surprisingly fun while retaining 30+MPG ratings. The C is also confident when braking. You do get the slight odd feeling that comes with every regenerative braking system, but compared to the competition it’s the most natural feeling brake peddle in a hybrid. On rough pavement the Prius C maintains a comfortable ride but delivers more noise to the pasengers than I’d like to hear. The Toyota Prius C is the best of the Prii and offers fantastic comfort and drivability while saving you money in the long run. The 2012 Toyota Prius C starts at $23,230, with alloy wheels and delivery $26,140. The Prius C may be the baby or “bargain bin” Prius, but I’m also confident it’s the best of the group. The Prius C ditches some of the quirk and oddity that is present in its originator. The car is comfortable and confident on the road and the interior’s fit and finish puts it a head above the competition. When you combine that with the down right addictive fuel economy you get a lot of bang for your buck. Oddly, the Prius C also make the Yaris rather irrelevant. At just $5,000 less it would be hard to justify not stepping up to the Prius C for the fuel economy alone, add in the vastly improved interior and it’s a no brainer. When I review cars I try to look at them as a potential buyer and the Prius C would most definitely be on my short list if I was.